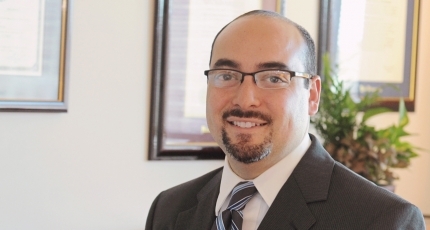 Tomas Garcia is an associate in the firm’s Litigation group. His practice includes a variety of commercial, healthcare, torts/personal injury, and transportation litigation. He has experience representing business professionals in corporate disputes, health care facilities and medical professionals in malpractice and regulatory matters, governmental entities in matters arising under the New Mexico Tort Claims Act, and commercial transportation companies in actions in state and federal court. Tomas is a former chair of the State Bar of New Mexico Young Lawyers Division, the public service arm of the State Bar. He has served on the New Mexico Board of Bar Commissioners, and has been a member of the New Mexico Supreme Court Rules of Civil Procedure Committee. Tomas has achieved an AV® rating from Martindale-Hubbell based on a peer review and has been recognized by Southwest Super Lawyers® as a Southwest Rising Star. He was named “Young Lawyer of the Year” in 2015 by the New Mexico Defense Lawyers Association. An Albuquerque native, Tomas received his law degree from the Georgetown University Law Center. While attending law school, Tomas practiced as a student attorney in the Georgetown Federal Legislation and Administrative Clinic, where he assisted in the representation of a client with a legislative proposal pending before the United States Congress. Tomas also worked as an extern at the U.S. Department of Interior in the Immediate Office of the Solicitor, where he researched issues related to records management, rulemaking, public requests under the Freedom of Information Act, and other administrative law matters. Tomas received a bachelor’s degree in political science from Yale University, and a master’s degree in public policy from the John F. Kennedy School of Government at Harvard University. Prior to joining Modrall Sperling, Tomas clerked for the Honorable Charles W. Daniels of the New Mexico Supreme Court. In a product liability case involving an alleged defect of a table saw, was a member of the team that obtained a ruling from the Tenth Circuit Court of Appeals affirming the district court’s summary judgment for the defense. The summary judgment interpreted a series of corporate acquisitions. Plaintiff argued under New Mexico law that the corporations that had acquired the saw’s manufacturer were liable based on the product-line exception to the general rule of successor non-liability. The appellate court determined that Texas law applied and that defendants were not responsible for the design, manufacture or marketing of the table saw at issue. Motions dealt with evolving issues of personal jurisdiction, choice of law and important questions of successor liability.